When the weather is freezing — or rainy — or scorching and your kids are stuck inside they tend to get a little wild. At least mine do. 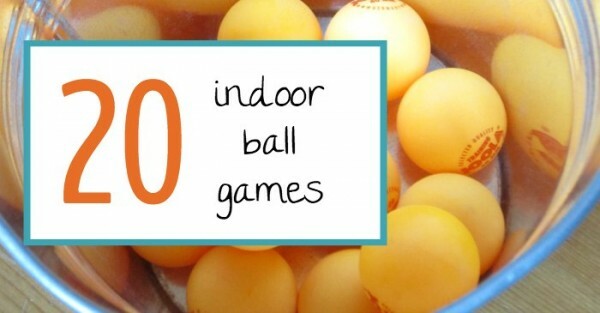 Have you ever considered indoor ball games? Indoor ball play ideas are a great way of helping them burn off a little energy indoors! Now I know what you’re thinking…. 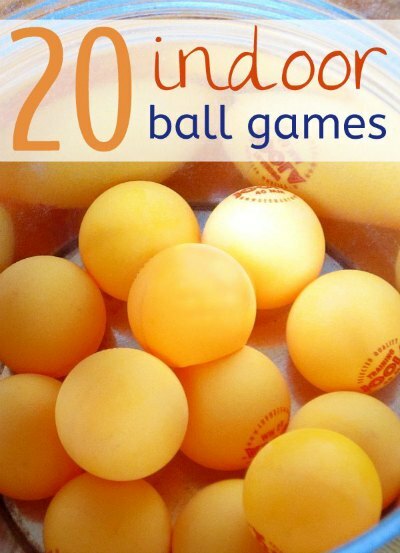 “Ball games for kids to play indoors? No Way!” As a matter of fact, I’m pretty lenient about letting the boys engage in active activities indoors even though our apartment is tiny. I set a few ground rules (my #1 rule is no fighting) and make sure they’re not aiming at my expensive china. Just joking. I don’t have any expensive china. Don’t forget, you can CLICK on any of the orange links below to find out more! Set up a carnival style game using a large cardboard box. You can cut openings in a large box, label them with point values and start a competition! Simple ball-cup toss. Set up a group of paper cups or plastic containers. If you like, wrap a long piece of duct tape around them to prevent them from falling over. Use a homemade catapult for target practice. You can make a simple catapult with a plastic spoon or by gluing a bottle cap to a piece of cardboard and balancing it on a paper roll. We originally used pom poms as ammunition, but the boys have switched over to — you guessed it — ping pong balls. Set up a group of large boxes for a ball toss. Vary the size and height of the boxes for extra fun. Use balled up socks for extra safety. I love how Little Bins for Little Hands did this on the stairs! Indoor paddle play. This is a classic idea I originally saw a few years ago at Toddler Approved. Make paddles out of paper plates and paint sticks or rulers. She used balloons, but my kids usually use ping pong balls. Ping pong ball battle. The kids invented this indoor ball game on their own. Tape two cups on opposite ends of the table. Each player gets a ball and a straw. (Yours truly is of the opinion that a sturdy pencil would work better, but I was out-voted so what do I know?) The object is to get your own ball into your cup while preventing the other player from doing the same. One word: chaos. For a super easy ball game on the floor, turn a box upside down, cut little windows along the bottom of one edge and roll balls through the openings. Assign point values to each opening and practice your math skills! Set up a tape shape on the floor with some painter’s tape for some directed bouncing. This is so easy, but you would be surprised at how entertaining it is. Mama Smiles has instructions for how to play marbles, French style. Set up a court for Indoor Foot Volleyball. Be sure to clear the area! Indoor bowling. Set up a tower up paper cups, yogurt containers, a variety of plastic containers headed for the recycling. TIP: the cups or containers don’t have to match or be in an exact formation for kids to have fun. Experiment! See indoor bowling in action at Powerful Mothering. I hope this list of indoor ball games encourages you to let your kids burn off some energy indoors with a little rowdy ball play. It’s okay, it really is! However, if you still remain convinced that fun indoor ball games are not for you, there are plenty of low key ideas on our giant list of indoor activities. Very cool – love your ping pong table battle! Thank you for including us! What a great collection of ideas to keep everyone busy! These will certainly come in handy that next rainy day – thanks for putting this together! 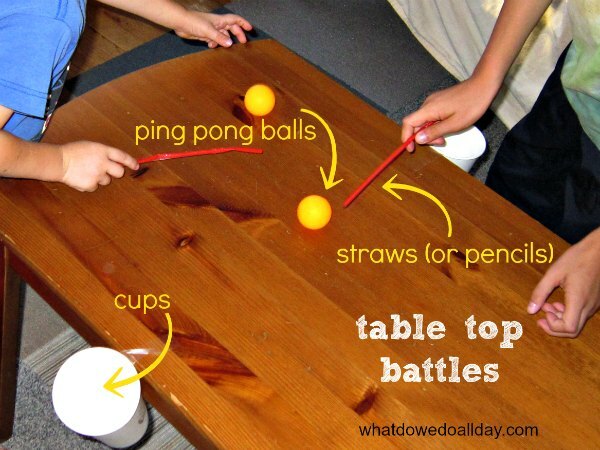 Love the ping pong battle game – We played something similar when we were young, but we used to blow the ping pong with the straws. Often, the ping pong would dent, so we would roll up newspaper into a ball with tape. my kids love marble ball. a down sized version of carpet ball. made a table out of sanded pallet wood.